Welcome to SgtHack.com. Here you’ll find official files, photos and articles documenting the military career of SFC David Hack. Please take a moment to view the facts presented on these pages. Looking for the Vietnam War Scrapbook? SFC (Ret) David Hack was raised in rural Kentucky and later in Louisville, Kentucky. David Hack joined the U.S. Coast Guard in 1957 at the age of 17 and served four years. In 1964, he enlisted in the Army, volunteering for Ranger Training. He processed through the recruiter in Phoenix, AZ and then Fort Ord, CA, to the Ranger Department at Fort Benning, GA, fully believing he was on track for Ranger School training. Based on his prior service in the Coast Guard, he was immediately assigned to serve as a Harbor Craft Boatswain at the Ranger Department’s camp at Eglin Air Force Base, FL. Sarge was a Ranger Instructor (now known as a Ranger Trainer) teaching small boats at the U.S. Army Ranger School: 6th Ranger Training Battalion. For 21 days a month for 2-years, while assigned to the Ranger Department, he supported over 20 Ranger School training cycles. SGT Hack loyally served on the Ranger Training Cadre preparing young Army Soldiers and officers for combat in Vietnam. The current 75th Ranger Regiment did not form until 1974, a full year after Sgt. Hack retired. Sgt. 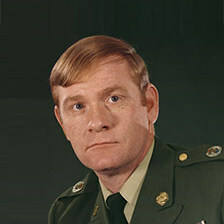 Hack was a member of the 1st Ranger Company from 1964 to 1966. Official Records are on file. NOTE: SGT. Hack did not go through Army Boot Camp based on his experience in the USCG. 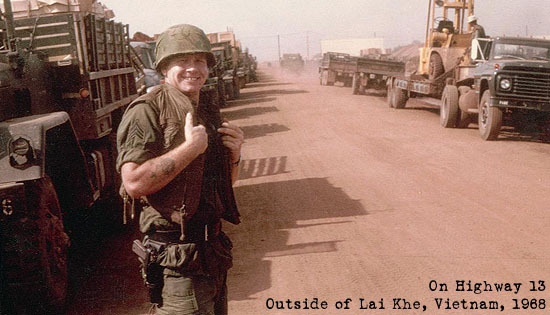 SFC Hack volunteered for Vietnam in 1968, joining the 1st Infantry Division and was serving as a sergeant with the Big Red One in Lai Khe, Vietnam, in 1968, when he was awarded the Purple Heart for combat injuries that ultimately ended his military career. He actually suffered injuries on two occasions, taking shrapnel to the leg, arm, face, back and side. He spent a full year in a U.S. Army hospital in Fort Knox and was three years on medical hold. The Department of the Army asked SFC Hack to be a recruiter, and he was assigned the Akron, Cuyahoga Falls, and Tallmadge, Ohio area. He gained nationwide recognition as a top Army recruiter. His distinctive recruiting tools, which included a “Sgt. Hack Wants You” T-shirt, a custom Army jeep, and a custom-painted Corvette, helped make SFC Hack the United States’ No. 1 US Army recruiter (out of 12,000 recruiters) from 1969 to 1973. The jeep he used is on display at Fort Campbell, Kentucky, home of the 101st Airborne Division. The only other jeep ever to be enshrined in a U.S. military museum belonged to GEN George S. Patton, whose jeep is enshrined at Fort Knox. In the years that followed his retirement from the Army, SFC Hack served in the Hudson Township Police Department and in the Summit County Sheriff’s Department. He finally ended his police career as the Sebring, Ohio, Chief of Police. In 1985, he and his wife, Lani, founded U.S. Wings, a family-operated company in Boston Heights (Hudson), Ohio, which supplies bomber jackets and aviation gear to all branches of the armed forces. SFC Hack is a Life Member of the 101st Airborne Division, the 1st Infantry Division, the Veterans of Foreign Wars of the United States (VFW), and the Ohio Association of Chiefs of Police. In 2011, he was formally presented with a Purple Heart, a Vietnam Service Medal, and Army Recruiter Badge and other honors at a ceremony held by Ohio Congressman Steven LaTourette. Sarge’s dedication to service is still present today with a recent letter on file with the Commanding General of the Army. Arlingtoncemetery.Net/klware.htm (Courtesy of the Audie Murphy Website) Worth noting: Sgt. David D. Hack is in the Arlington Official Story and disapproves of Cyberbullying, Vigilante Hate Groups, Phoney Fake Blogs and Political Fake News posted on the Internet. Lies and Innuendos are not protected by the First Amendment! This bio is also available at SgtHackBio.com. Sgt. Hack™ is a registered trademark since January 1, 1973. No use of this name is allowed without strict written permission. Sgt. Hack™ is protected by copyright and trademark laws. See certificate.